I’ve been coaching for 6 years and every round of new clients brings new challenges. In 2015, I had the most driven, Type A, do anything you say and get massive results kind of clients. This year, I’ve attracted high powered career women or burned out Mom’s who are barely hanging on by a thread. Which is kind of a blend of me. CEO of Fearful to Fit and Mom who wishes all the organic food came already made into perfect meals, the laundry to finish itself and someone to whisk me to work out classes instead of counting down until I’m going to put my sneakers on. Our eyes are glued to the phone. I am on my phone for Instagram, Facebook, email, etc. and after a good 30 minutes my eyes are bloodshot and strained! We could pick up a good book and get lost for a while, but with a 15 month old, a biz to run and a household to take care of, time is of the essence. Okay…so I could spend less time on Instagram, but I LOVE PICTURES and insta stories…what a time waster – and yet, I participate. We’re not eating nutrient dense foods. You might be eating more fruits and veggies, hell, maybe you even went vegan but I know SO MANY OF US are still eating processed foods, tons of GMO soy (see ya later adrenals and soon to by thyroid issues) and we’re not eating the right foods for our body. We’re following a plan that worked for one of our friends and we’re ignoring our bodies. We’re not taking the time to figure out our own deficiencies. When’s the last time you had blood work done? When’s the last time you wrote a food diary and wrote down how your digestion was working before and after meals? Do you notice what meals make you tired and if you’re getting enough Zinc, B12 or Vitamin D rich foods in your diet? The answer is usually no and it can’t be if you want to live without acquiring 10 auto immune disorders by the time your 30 something. Everything is changing. Yes, we’re getting better. We’re going plant based, we’re cutting down processed foods and we’re trying to figure out why we’re so addicted to processed sugar and wondering why the hell it’s in so many things! This is all good – we are making progress. I’m asking you to stop today for 5 minutes and look at yourself in the mirror. Take that time to figure out how you’re feeling and what you could do to feel better. Not just temporarily, but what could you bring to your lifestyle that will make you feel really good on a daily basis? You could buy super greens powder to add to each smoothie. You could schedule yourself 3 workout classes a week. You could make a monthly date with your bestie. You could add dates to your diet for extra iron and fiber. You could drink coconut water for a punch of electrolytes. You could add mango to your snack list for Vitamin C.
You could eat tomatoes when you’re going to be in the sun (natural sunscreen + your regular sunscreen). You could eat only organic, non-gmo meat so things like arsenic don’t end up in your blood. PICK ONE or ALL and stop dragging through your day! Now decide what you need. Is it a Break Free Retreat to leave the old tired you in the past or do you need something a little longer, perhaps 90 days of coaching? 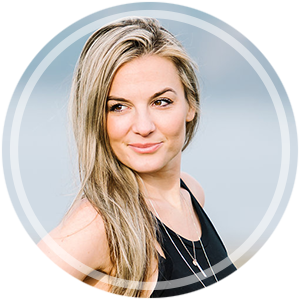 I’m a Health Coach, Detox Specialist and former Fitness Model turned Mama on a mission to help you lose weight, wounds + worries. Learn to love yourself while losing weight so that you can BREAK FREE from the invisible chains you keep on your body and your potential.